With snow on the ground and a chill in the air, many anglers forget how great the fishing can be in the winter. 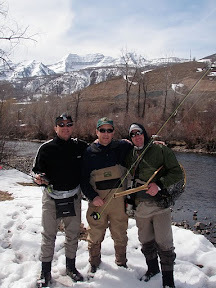 Trout feed year round and as a result there can be some great winter fishing opportunities here in Utah. Because most anglers are skiing, snowboarding or pursuing other winter activities, you can frequently have the entire river to yourself to experience some solitude and relaxation. Frequently during the winter, we can get warm weather patterns and you can find yourself on the water during sunny, beautiful conditions. You only need a few hours during the best part of the day to catch a few fish and can even fit it in after a morning of skiing or snowboarding. Many of our local Utah rivers are tailwaters (rivers that flow from a man made dam). Because of this, the water temperature in these rivers tends to be more constant throughout the year with less fluctuation and as a result the water temperature is typically warmer than non dammed rivers. Because trout activity is higher when the water temperature is warmer, the winter fishing on these tailwater rivers can be quite good. In fact, there are times when the fishing in the winter rivals the fishing of any other time of the year. Our primary local rivers, the lower Provo River, Middle Provo River and Weber River are all tailwater fisheries and where we focus most of our efforts during the winter months. Like most times of the year, trout feeding in the winter is largely dominated by subsurface feeding and as a result much of the winter fly fishing we do is strike indicator nymphing. However, there are opportunities to dry fly fish to rising fish on the surface, and occasionally we might throw a streamer to try and entice a trophy. It largely depends on the conditions we encounter each day and the ability of the angler. One common characteristic of winter fly fishing is that unlike many other times of the year, the fish tend to school up and concentrate in the slower, deeper pools where they can conserve energy so if you find them you can frequently catch several fish. Far and above the most productive method of winter fly fishing (and any time of the year for that matter) is strike indicator nymphing. Being that the fish are concentrated in the slower deeper pools and runs during this time of the year, this is where they do most of their feeding. Because this is where the trout are hanging out and feeding, nymphing is the best way to catch them. Frequently during the winter the fish can key on very small nymphs, but our guides have you covered with their own special patterns to imitate these smaller food sources. On many winter days, especially toward late January through spring, midges can hatch in large numbers and the fish can be found rising to them in the slower edges and seams. It is during these times that the winter fly fishing is in its true glory since it doesn’t get much better than large rising trout on a crisp clear winter day with the river all to yourself. This type of fishing isn’t easy though since midges are quite small. The flies to imitate them are also very small and can be difficult to see and drift correctly. Our guides are well versed in tracking small flies and have specialized fly patterns that are easier to see to help you fool those large rising brown trout. A peaceful, sunny winter day on the water with the river all to yourself can be an incredibly relaxing experience. Winter fly fishing is a great way to get rid of cabin fever and enjoy some fresh air and excitement of catching a few trout. If you haven’t tried winter fly fishing before or you have and haven’t been for a while take a trip with us and let us show you what a great time awaits you on the rivers in winter. A few days of skiing or snowboarding have your legs worn out? Take an afternoon winter fly fishing trip with us, it will be an experience you won’t soon forget.